Adventures of Peter and Gus! Last week my friend Kate helped get Peter and I out of the house for story time. It was great! Story time was tailored specifically for newborns to 18 months. There were songs, rhymes, and of course a story! Developmentally it's still hard for Peter to sit and listen to a story (even his tiny board books) BUT it is still so important to read to your babies. 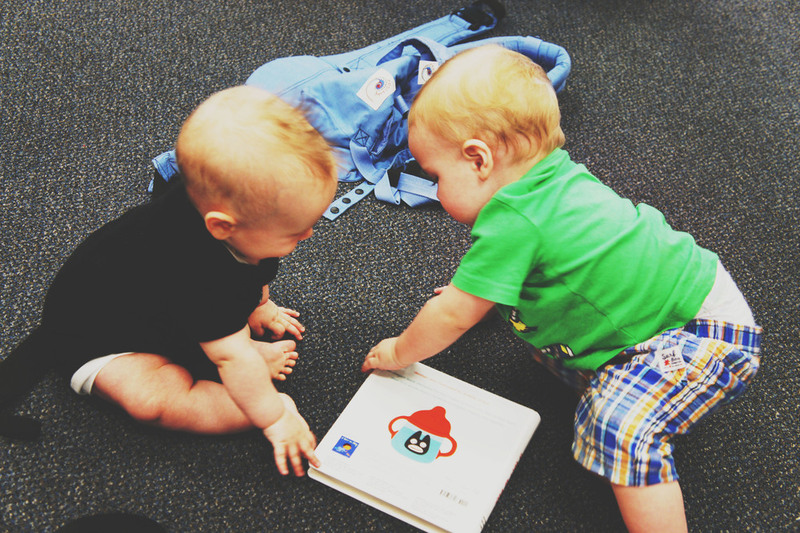 Reading to your baby/kids is important for their oral and language development. Their vocabulary will grow and their ability to summarize a story and re-tell it will improve. Peter and I try to read at least one book a day. Check your local library for story times! It's worth it! Gus found a good spot to play on the activity center in the children's section. He was working really hard! Peter was busy exploring the stacks. And pulling down as many books as he could. He found one that he liked! He is getting so big! Peter tried to move in on Gus' activity area. Naturally Gus decided to get Peter back by pulling off his shorts. Best friends already. Then they decided to spend some time reading together! Looking forward to more story times! Also, stay tuned for more adventures of Peter and Gus!